Dog lovers soon come to think of their new puppy as a family member. The cute little balls of fur get pampered with fancy collars and leashes, and sometime, even elaborate wardrobes. Why not go a step further and get the cute little pup its own apartment?! Wait…..the puppy also needs to be potty-trained. Since potty-training is a frustrating and time-consuming chore, why not get a potty-training puppy apartment (called a PTPA)? The apartment eliminates the mess, odors, time and frustration of potty-training. The PTPA is a specially designed crate containing two areas, a sleeping area and a bathroom area, separated by a divider with a central opening……..creating its own two-room apartment. The bathroom space holds a specialty-made puppy attractant pad; the bedroom area has comfortable bedding. There are three doors to the apartment; one goes directly into the sleeping space, one right into the potty area and another cage door allows the occupant to have an alternative entrance. The opening in the divider allows the puppy to travel back and forth between bedroom and bathroom without leaving the apartment. A video is provided with instructions on the correct way to teach your new puppy to use the bathroom space in the PTPA. The apartment is easily set up in minutes and ready for the puppy to move in. 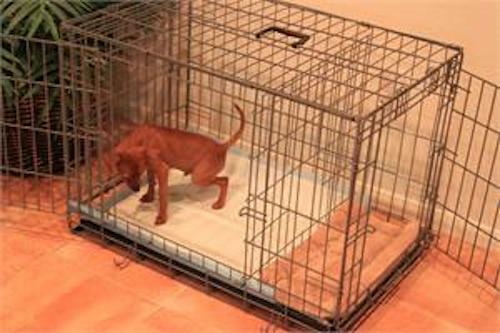 As your puppy grows and needs more bedroom area, the divider can easily be moved over to create more space. The PTPA is available in different sizes to accommodate the growth of your loveable family friend. The construction of the crate allows the PTPA to be placed in the most convenient area of your home. It can be tucked into a corner of the room or displayed as part of your home décor. Several covers are also available to give your puppy the privacy it needs and also to be decorative to fit into the room as another piece of furniture. Just as you decorate your home, your puppy’s apartment can also portray a theme with the additional accessories available. However, the main purpose of the PTPA is to potty-train your puppy the correct way while giving it the pampering it needs. I wish they’d had these back when my dog(13 yrs old) was a pup. We didn’t crate our dogs. The German Shepherd really didn’t need it, but the hound would have likely benefited. That’s really a good idea so long as the puppy doesn’t go trouncing around the big section when in the apartment but not sleeping! I like that the size can be changed to accommodate a growing puppy too! We crate trained our puppy and he did very well! Only a few accidents in the past 6 or so years. A potty-training puppy apartment sounds wonderful! Good to know that the PTPA is available in different sizes to accommodate the growth of our furry friend! No pups for us, just kittens but I’ve been thinking about getting a dog..
that is a good idea for training. We crate trained our dog when we first adopted him at 8 weeks old. It helped tremendously! Now he’s over 2 and just uses his crate for traveling in the rear area of our SUV. What a great way to train a pup! We crate-trained our pup but never thought to use the divider like that. Ingenious! This is such a good suggestion to train one’s dog! Thanks for the tip! That is very interesting. We crate-trained our two dogs. That is the first I have ever seen one designed with a bathroom. Thanks for the idea! We are in the process of getting a puppy. I know this works. My in-laws have something like this for their dog. Also, my daughter has fostered puppies, and uses a similar idea for them. Do you know what the actual process is? I made my own puppy apartment out of a regular crate but im wondering whats on the “instructional video”. How exactly do they want you to do the training? I wouldn’t get a puppy because I don’t have the patience to house break one. Thankfully our dog is an outside dog and we didn’t need to worry about puppy training, though he was well on his way when we bought him. What a process to try to potty train a dog! Good info in this article! It’s always a process to train a puppy, but I was never fond of the cages. We paper trained. What a great idea! My dog doesn’t have a sectioned kennel but she loves the one she has- she uses it as a retreat when the four year old is getting on her nerves or when she just wants to take a nap. We have a dog but we didn’t crate train him. We own our home and I work from home and was able to train him to go out when needed. Too cute! I don’t know anything about puppies, but this looks like a great product to help get them trained. I don’t have a pet, but thank you so much for the information! I didn’t crate train my dogs. They have run of the house. I am glad to see there are larger crate options available. I think it would be so hard to train dogs, glad this helps. We crate-trained all of our dogs — it was the easiest way and something they enjoyed… the loved having their cozy space. We don’t have a dog, so I’m not sure what’s the best way to train. I really need to look into this for our new dog Daisy because she is having way too many accidents in the house. This is just adorable and caring! We partially crate trained our rescue puppy, but he had been crate trained before we adopted him. he goes in the crate when we’re gone, but not at night- he sleeps next to our bed at night and has never had an accident. We didn’t use their crates for a bathroom but they go in there at night to sleep. I know little about raising a dog but one day I’m sure my daughter will tell me all about it. We keep our puppy in a huge kennel when we aren’t home but when we are he stays with us. He’s doing pretty good at only going outside so hopefully soon we won’t have to crate him. Crate an place the special divider in it. ?! Many people are purchasing a crate with a divider panel and cutting the whole in the panel themselves and sanding it down. I didn’t want to risk it, so we went with the Precision Elite Three Door Pet Crate. It has a door on the top and the divider panel actually folds in half so no need for us to cut a whole in it.